The author of this page will greatly appreciate comments, eyewitness accounts, documents and imagery related to the subject. Please contact Anatoly Zak. The A-9/A-10 rocket represented one of the earliest detailed studies of a multistage rocket, capable of crossing the Atlantic Ocean. According to von Braun's own writings, the rocket of this class was envisioned as early as 1936, when yet-to-be built propulsion testing stand in Peenemunde was designed to accommodate engines with the thrust up to 200 tons. It would be eight times more than needed for the A-4, but roughly enough for a transatlantic rocket. The A-9/A-10 concept emerged far ahead of its time, but it was fueled by a dream of the Nazi government in Germany to bomb America, which also gave it a name -- "Projektil Amerika." To reach New York, the A-10 upper stage, would have to follow a string of radio-beacons deployed on submarines spread across the Atlantic. For its final guidance, the rocket could use a transmitter installed by Nazi agents in a window of a high-rise hotel in the heart of Manhattan. 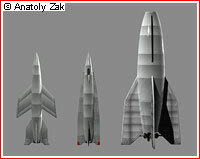 Another concept called for a manned version of the A-9 stage piloted by a semi-kamikaze pilot. The manned version of the missile, would be equipped with a pressurized cockpit, featuring life-support systems, cartographic radar, and, apparently, an ejection seat, which would allow a pilot to bail out shortly before impacting the target. The original concept of the A-10 rocket envisioned a test version with a propulsion system made of six combustion chambers, comparable to those on the A-4 rocket, but feeding a single nozzle. 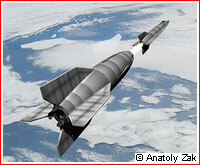 It could carry an A-4b-type rocket as its second stage, before the A-9 was ready. Like the A-4, the initial A-10 would burn mix of liquid oxygen with alcohol. Peroxide-driven pumps would be used to feed combustion chambers. A follow-on version, intended for actual bombing missions, was expected to have a single engine, burning a mix of nitric acid and diesel oil. If given time for implementation of the project and combined with German nuclear ambitions, the A-9/A-10 could potentially turn into a weapon of mass destruction in the hands of a regime, which had no hesitation of using it. However the complexity of the rocket and immediate prospect of loosing the war, forced Peenemunde leadership to abandon the far-fetched idea around 1943, so the development center could concentrate on the all-but-flight-ready A-4.